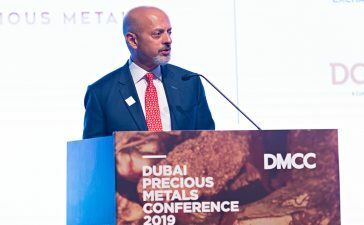 VOD Dubai International Jewellery Show – theMiddle East’s definitive jewellery and gem exhibition – got off to a spectacular start. VOD Dubai International Jewellery Show 2018 Is Declared officially open.VOD Dubai International Jewellery Show (VOD DIJS) – an event organised by DV Global Link, a joint-venture company between Dubai World Trade Centre (DWTC) and Italian Exhibition Group (IEG) – was officially opened today byHis Excellency Butti Saeed Al Ghandi, Second Vice Chairman of the Dubai World Trade Centre. His Excellency was joined byHis Excellency Helal Saeed Almarri, Director General of Dubai’s Department of Tourism and Commerce Marketing and CEO of Dubai World Trade Centre; Gianpaolo Bruno, Italian Trade Commissioner to the UAE, Oman and Pakistan; Valentina Setta, Italian Consul General to Dubai; H.E. Mr. Vipul, Consul General of India Dubai; Mr. Johnson Kam, Director and Ms. Catherine Chan, General Manager of Hong Kong Jewellery& Trade Manufacturers Association; Luca Veronesi, VOD DIJS Show Director; and Marco Carniello, Jewellery& Fashion Division Director – Italian Exhibition Group. The ribbon-cutting ceremony marked VOD DIJS up and running ahead of a jam-packed first day of the exhibition, special offers, glamorous fashion shows, seminars and meet-&-greets. This year’s show has been divided into four distinct categories – Global Brands, Fine Jewellery, Gemstones & Diamonds, and Packing & Technology – and visitors have been able to immerse themselves in the vital aspects of the global jewellery industry, such as craftsmanship, production, distribution, precious materials, trends, and much more on an opening day. Spectators were amazed by the exquisite jewellery pieces showcased by BNM Jewellery, Shenzen Sunrise, Hasbani, Tedora, and Diacolor International DMCC at the VOD DIJS fashion show. Designs from Kabarovsky and Jawhara will take centre stage at tomorrow’s catwalk sessions. On top of even more breath-taking fashion shows, visitors have lots more to look forward to on Day 2 of VOD DIJS 2018, including plenty of exclusive offers from participating jewellers and the chance to browse through over 25,000 jewellery pieces from local, regional and international exhibitors. After hearing great things about previous editions of the show, MAS Jewels Co-Founder and luxury lifestyle influencer Fatma Husam is participating for the first time ever at VOD DIJS, where she has been showcasing her two new collections – Hayma and Melikah. Registration to visit for free and enjoy everything the show has to offer is still open HERE, so get down to the DWTC from 2 pm to 10 pm on November 15th and 17thand from 3 pm to 10 pm on Friday, November 16th, 2018!